In practically no time at all—20-minutes—create a fabric postcard that is personalized and thoughtful. Commercially made cards are wonderful, but they can’t possibly pen the personalized message you’d like to send. With this quick paper-piecing tutorial and fabric from your stash you’ll have a beautiful card to send to your loved ones. If you’ve never tried paper piecing, here’s a very simple project to give you the confidence to sew! To start, download the file and print the pattern on Translucent Foundation Paper. Standard printer paper will work but will be opaque and more challenging to see through. Numbers in the design sections indicate the sequence in which fabric sections are joined. Place all fabrics on the unprinted side of the paper starting with the center section. Add fabric sections to the design in numerical sequence, right sides together. Stitch on the right side of the paper, following the marked lines on the paper. Position the next pattern piece. Stitch section in place, sewing from the right side of the paper and following the marked lines. Press fabric to cover seam. Repeat the positioning, stitching, and pressing until all sections are added. Place fabric section 1 behind the corresponding area on the paper pattern, with wrong side of the fabric meeting unprinted side of the paper. Optional: Pin fabric in place from printed side of the paper. Meet the edge of fabric section 2 to fabric 1, right sides together. From the printed side of the paper, stitch along the line (between 1 & 2) joining the two sections, starting and ending a stitch or two beyond the line. Press fabric to cover seam. Meet the edge of fabric section 3 to fabric 1, right sides together. From the printed side of the paper, stitch along the line (between 1 & 3) joining the two sections. Press fabric to cover the seam. A mini-iron works well on small projects. Repeat the process for each of the remaining 11 pieces. With the printed side of the paper facing up, trim block along outside line. Cut a piece of cardstock the same size as the heart block. The back side of a repurposed greeting card works great! Edgestitch heart block to cardstock, wrong sides together, using a scant 1/4″ seam. Use a decorative rotary blade to add a decorative edge. Add a message, postage stamp, and address—then mail your Valentine! P.S. Nancy liked the Extra Fine Point Erasable Gel Pens for writing and sewing. The markings are removed from fabrics with heat when ironed. Cool! 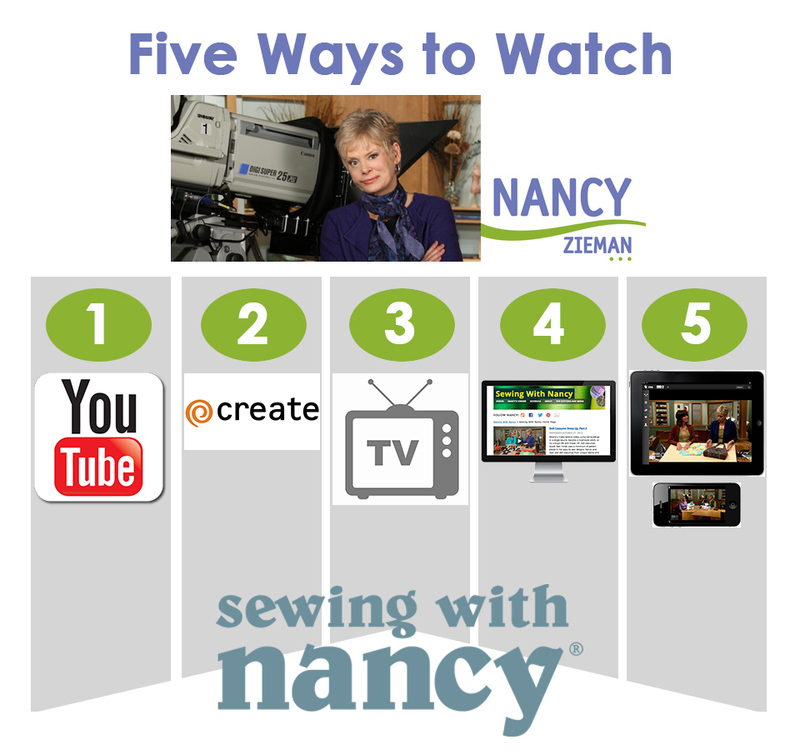 Watch Sewing With Nancy online and on any TV. Tell us if this is your first foundation piecing project, for a chance to win I Sew For Fun Heart Shaped Pins from Clover. The randomly selected winner of Nancy Zieman’s NEW! Afternoon Picnic Quilt Pattern and Afternoon Picnic Fat Quarter Pack is Ruth Bradford. Her comment is: I have fallen in love with the black and cream. Would love to make that pattern. Not my first paper-piecing rodeo, but it is an adorable, easy & quick way to make some special Valentines for friends. I did several and everyone loved them. Thank you! A heart similar to this one was one of my first paper pieced projects, in fact I make a different valentine paper pieced each year. As far as paper piecing goes I sew some rather difficult patterns now and love how all those pieces come together. The valentine paper pieced postcard tutorial sold me to try paper piecing. I love the cute edging and use as a postcard! I have never done paper piecing project before. This looks like a fun and easy project to do. This was my first ever paper piecing project when I made these. I made a postcard with them, had so much fun I made about a dozen more to make a small wall hanging using these blocks mixed in with other just plain blocks in sort of a brick pattern. I have never done paper piecing. This Valentine’s Day postcard seems like a festive, happy way to be introduced to this method. I have never tried paper piecing, but with Nancy’s tutorial this looks like it might not be to difficult to try for a first time project. I will definitely do this next year, but found too late for this year! I have not done much paper piecing, but this looks like something I could do. I have hesitated long enough. This will be my very first FPP project, and I’ll have to make lots of them, one for each of my children and grandchildren! Thanks!!! I believe I have done only one paper piecing project before. I’ve been wary of trying paper piecing — this is a good project to encourage me to start! I have done only 1 paper piecing project to date. I haven’t paper pieced in many years but have been thinking I need ti try again and this appears to be an easy project to tackle. Thanks. love paper piecing. never thought to make a postcard though. am sending one to England to my Grandchild there. What a lovely Valentine’s Day project! I have completed several paper pieced projects and plan to make some of these heart postcards. My first quilt was a sampler and had a paper pieced block in it. This is not my first time paper piecing. I love paper piecing. I love the precision of it. This is not my first fpp project. I LOVE to paper piece. Thank you for the lovely project. I have not yet tried paper piecing. I like the idea of projects to use up those small bits of fabric stash that I save. The heart project is perfect for this coming holiday. I love paper piecing. I have done it several times. Thanks for the giveaway. I just made this paper pieced heart and turned it into a mug rug. I’m going to send it to my granddaughter for Valentine’s Day. I have tried some paper piecing but will try this project with excellent directions. This will be my first paper piecing project to be mailed as a postcard, that’s for sure. I am making one this afternoon to send to my granddaughter. I will use red polka dot fabric for the heart. I am not sure what to use for the border but I am sure I will find something in my stash that will look smashing. Thank you for the idea. We had a class at our guild I made one and haven’t made another maybe I will try this. There are so many great patterns out there. I know I need to get on board. This was my first paper piecing project. I went beautifully and easily with the directions supplied and the pattern downloaded. Thanks so much for this easy and thoughtful Valentine’s project. This looks like fun for a first paper piecing project. Going to check my stash and try it this afternoon! My adult children will be surprised to receive such a special valentine! Thanks! I like paper piecing because it is so precise. I have been asked to teach it in a neighboring town. I love paper-piecing! This postcard is so sweet! I took one paper piecing class (butterfly block). Loved it. Nancy’s heart will be my second attempt. Thank you for continuing Nancy’s wonderful website. I love paper piecing. Not my first try but I hope I win those green pin as I was born on St.Patrick’s day. My first paper piecing project was a table runner that I later free motioned quilted on my machine. Love the process. This is not my first foundation piecing project. I’ve made a 12 month wall hanging paper pieced project. I love the simplicity of this Valentine project. Thanks! I made a Christmas paper pieced wall hanging 10 years ago. I am ready to do some valentines. Really cute idea. This is my first foundation piecing project. Will have them hand stamp it at the post office. Love those pins. I have made one paper pieced wall hanging. I would like to make this and send it to my granddaughter for Valentine’s Day. This a cute pattern that could be adapted to all fabric and used as a hot drink coaster. This would be my first attempt at paper piecing and really love the looks of the green clover pins. I love you are keeping Nancy sewing with us each day. I have done paper piercing before. It is quite a challenge until you get the hang of it. I’ve never tried paper piecing. I have done lots and lots of paper pieced projects and love it. This is exactly what I was just searching for, an easy, quick valentine I can make to send to my adult children to let them know I’m thinking of them…I’m doing this one TODAY! I have done quite a bit of paper piecing. A wonderful way to get very sharp points. I’ve tried it on one block in a quilt. I wasn’t overly impressed. Nancy’s tips might help me enjoy it more. I have done a few paper pieced projects. I have nevedone a postcard that I put in the mail. This would be my first paper piecing project. I am going to try it. I am surprised to learn you can mail this fabric card without an envelope.